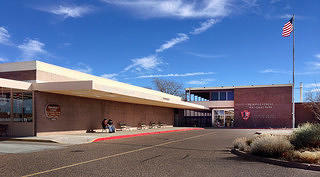 In January, Department of the Interior Secretary Sally Jewell approved the designation of the Painted Desert Community Complex as a National Historic Landmark. Following on the heels of the announcement was the successful restoration of the complex's gleaming Oasis Building storefront. Now, it’s time to celebrate these achievements! We hope you will join the National Trust, the National Park Service (NPS), and our local partners as we mark the milestone. When: Wednesday, April 19 from 1-2 p.m. This event is free and open to the public. A reception and tours led by Park Superintendent Brad Traver and NPS staff will follow the celebration. Find more info about visiting the complex on the NPS website. What a great start to 2017 for the Painted Desert Community Complex! After unanimous approval of the Landmarks Committee in October, we received official notice from the Department of the Interior that Secretary Sally Jewell has approved the Painted Desert Community Complex as a National Historic Landmark! We are celebrating this news with our many partners who have advocated for greater recognition of the Neutra-designed complex in the Petrified Forest National Park and supported its restoration. This achievement is due in large part to the hard work and dedication of Superintendent Brad Traver and the staff at the Petrified Forest, the Arizona Preservation Foundation, the Tucson Historic Preservation Foundation, and Modern Phoenix. While this is a fantastic milestone, there is still much work to do at the Painted Desert Community Complex. Help support our work and stay tuned for more coverage of our progress on the restoration of the Oasis Building storefront in February and March! "The Landmarks Committee of the National Park Service Advisory Board unanimously recommended National Historic Landmark designation for the Painted Desert Community Complex today. It will be further reviewed by the Advisory Board this fall and, if recommended at that step, it will go before the Secretary of the Interior for designation. Today's recommendation is not the end of the process but it puts this important property on the path to Landmark designation." While there are still several more critical steps to go before the National Historic Landmark designation is official, this is an exciting beginning! We will keep you posted as the designation process moves ahead in the coming months. Great News from the Painted Desert! Much to share from the Painted Desert! The past few weeks have been full of good news, representing the fantastic progress made at the Painted Desert. As the new year approaches, we look forward to continuing the momentum and great work in 2016! First off, on November 9th, American Express and the National Trust for Historic Preservation announced $1 million in funding to support the restoration and preservation of five National Treasure sites, in or adjacent to National Parks. A grant of $150,000 was awarded to the Painted Desert Community Complex to fund restoration of the original glass storefront of the Oasis Building. This section was removed and covered over decades ago, completely altering the original Neutra/Alexander design and blocking views from the original gift shop and diner. The Petrified Forest National Park and Heritage Partnerships Program, Intermountain Region, and National Park Service (NPS), have partnered on an effort to nominate Painted Desert Community Complex as a National Historic Landmark, the highest level of recognition for a historic place. Designed by nationally renowned California architects Richard Neutra and Robert Alexander, the Painted Desert Community Complex is also an outstanding example of the International style adopted by NPS during that time, and represents the agency’s use of private architects to promote the shift to modernism in the parks after World War II. NPS hired Front Range Research Associates, Inc. (FRRA) of Denver, Colo., to complete the nomination, which will likely be considered by the Landmarks Committee of the National Park System Advisory Board during its fall 2016 meeting. Finally, a new concessionaire has been selected, after more than two decades of working with Xanterra Parks. The new concessionaire is Ortega National Parks. The family owns and operates El Rancho Hotel in Gallup, and several businesses in both retail and food service on the square in Santa Fe. They also operate park concession contracts at other national park sites, including Carlsbad Caverns National Park and White Sands National Monument in New Mexico, Acadia National Park in Maine, and the Stovepipe Wells area of Death Valley National Park in California. All the equipment is stored away, the scaffolding is down, and the tarps have been rolled up. Now the many months of hard work and planning can finally be seen and appreciated! 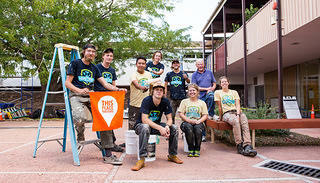 The recent HOPE Crew project at the Painted Desert Community Complex brought together a group of crew members from the Arizona Conservation Corps with the National Park Service staff, craft expert David Charlesbois, and the analytical skills of Historic Resources Group, to revive the striking original colors of the Painted Desert Complex. Most visitors over the last 30 years have only known the Complex in its modified form, as a result of alteration made by the Park Service many years ago. But that drab tan and brown paint job is finally banished, replaced by sparkling white plaster surfaces accented with silver structural members and dark red spandrel panels. Richard Neutra and Robert Alexander would be proud to see their last remaining Park Service structures sporting the colors they intended!